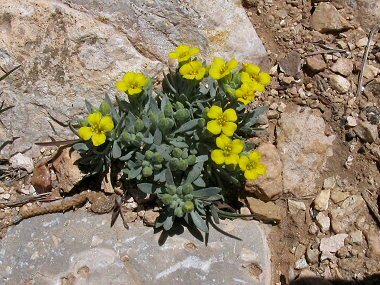 Bladderpod Mustard is a member of the Mustard Family. The plant grows to 16 inches in height and has green leaves with a silvery look to them, due to the fact that they are covered with tiny hairs, that are lance or spatula shaped and grow to 2 inches in length. The plant typically grows in desert flats, dry plains and on mesas at elevations between 100-5000 feet. Bladderpod Mustard typically grows in a spreading clump. Bladderpod Mustard bloom between February - May and produces bright yellow flowers with four rounded petals that grow to 0.33 inches in width. Flowers are followed by a spherical pod tipped with a slender point to 1/8 inches in diameter.